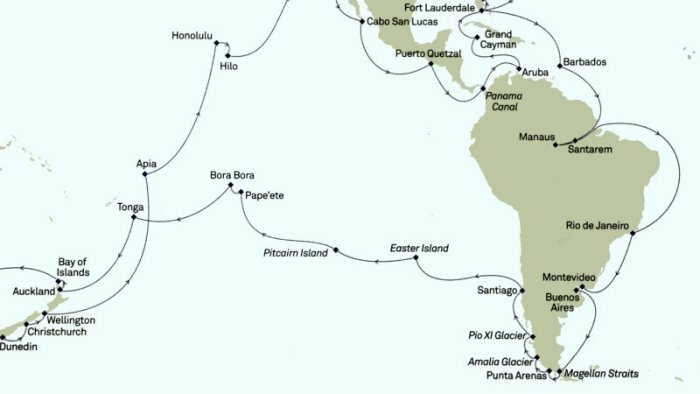 The Magellan Strait was named after Ferdinando Magellan who sailed through this narrow short cut between the Atlantic and Pacific Oceans. Unfortunately our voyage through was mainly at night and we awoke to find the Queen Victoria at anchor off the port of Punta Arenas. Punta Arenas is the southernmost city on the South American mainland. The city is the capital of Magellan's province, named after the marine explorer Ferdinand Magellan. His ship went through what is now the Magellan straits between the Atlantic and the Pacific in 1520. February is the middle of summer yet here the temperature was recorded as only 3 degrees the day before we arrived. Having dressed warmly, the sun was shining and there was no need for winter hats and gloves. We were lucky and it did not rain. There had been very little wind as we arrived and when we left it was only rising to 25 knots. The Queen Victoria had to anchor and use her tenders so we were fotunately there was not more swell. The forecast for overnight and tomorrow is for rough seas in the Pacific, so we will have to wait and see. The most popular excursions are to visit the penguins, and Cunard offer tours by boat or RIB to Magdalena Island. The Magellan penguins who breed there are small, no more than 2 feet tall. Instead it is also interesting to spend a few hours exploring the town and visiting the museums. The tenders arrive at the Cruise Terminal building with its craft and souvenir shops. Just a short distance ahead is the wide Avenida Independencia with the statue of General Don Bernardo O'Higgins. He was the liberator and the founder of the Chilean State. On the right, the main road, 21 de Mayo leads to the main square, the Plaza Munoz Gamero or Plaza de Armas. Those who had walked from the tenders were re-united with those who were on the organised bus tours at the statue of Magellan which celebrates the 400th anniversary of Magellan's voyage. There is a mermaid and two indians at his feet and many people stopped to rub the feet of one of the indians for good luck and in the hope of returning. There are several important buildings around the square : the cathedral, the Casa Espana, the old Town Hall, and the Casa Braun-Menendez which houses the Club de la Union. Further along the Avenida Bulnes is the Municipal Cemetary. This is hidden behind a wall but worth the visit. The simple graves contrast with the extravagant tombs. That of Jose Menendez, the wool baron, is said to be based on the Vittorio Emanuelle monument in Rome. It was about 2 kms to walk back to the tenders and we passed a large supermarket and were finally able to purchase decaff coffee and breakfast cereal. We were then carrying too much to spend time in the Sarah Braun Museum.